Even the most logical and grounded learners are guided by their emotions. As humans, we feel before we think, and our hearts tell our heads whether the information is worth learning. In this article, I’ll explore the basic principles of the Plutchik’s Wheel of Emotions and share 5 tips on how to use it in your next eLearning course. Robert Plutchik, a noted professor and psychologist, developed the Wheel of Emotions in the 1980’s. At the time, Plutchik wanted to provide a visual representation of the psychoevolutionary theory. However, since its inception the wheel has been used by writers, therapists, and educators alike to understand the delicate balance of human emotions. The Wheel of Emotions looks much like a traditional color wheel, and features 8 primary emotions that grow in intensity as you move into the center of the diagram. For example, joy falls in between serenity, which is a lighter color found on the outer ring of the wheel, and ecstasy, which is darker and at the center of the diagram. 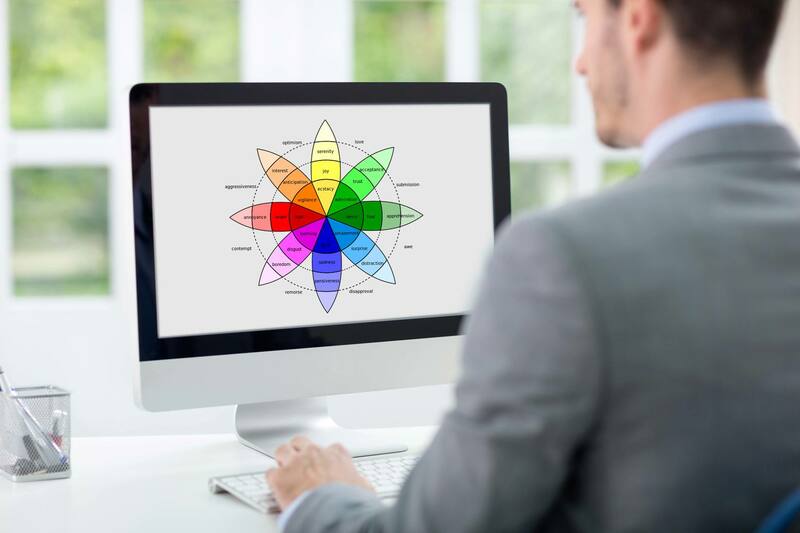 eLearning professionals can use this wheel to develop powerful and engaging eLearning courses by connecting with their learners at an emotional level. According to Plutchik, humans experience eight different primary emotions, which can be divided into 4 distinct pairs of polar opposites; joy-sadness, anticipation-surprise, fear-anger, and disgust-trust. Plutchik also believed that every emotion we experience is a combination of the 8 primary emotions. For example, a blend of sadness and disgust may result in remorse, while joy and trust can produce love. Know the right recipe for blending emotions. In order to bring out certain emotions in your learners, it’s important to know how to properly mix them together. Emotions can be hard to classify, and even harder to stir in our audience. However, if you are aware of the basic ingredients you need to create each emotion, you can trigger just the right feeling. If you want to inspire and motivate your learners, for example, you would want to utilize optimism. By looking at Plutchik’s wheel, we can gather that anticipation and joy are the key ingredients of optimism. Let your learners know the benefits of learning the information and allow them to track their progress to take care of the “anticipation” element. Add in a touch of “joy” by including a lighthearted story or a cheerful narrator, and you’ve whipped up a batch of optimism. Bring a smile to their faces. It’s a known fact that joyful and happy eLearning experiences boost knowledge retention and recall. This is primarily because the mind ties the information to a favorable experience, which makes it easier to remember in the real world. While our brains may hold onto sad memories, they recall happy experiences with much greater detail. You can bring a smile to their faces by using motivational wording, uplifting colors, and background music that soothes and calms. Make it entertaining and fun so that they never forget the eLearning course, or the information they learned from it. Create interest and intrigue by telling a story. Gain their trust and make them feel connected to the eLearning experience by telling them an emotionally engaging story. Include characters who exhibit specific emotions featured in the Plutchik’s wheel to trigger the right combination. For example, a character who exhibits anger can provide a stark contrast to a serene or affectionate protagonist. Make them empathize with the characters so that they feel like they are part of the story, but also remember to tie it all into the primary learning objectives of the eLearning course. Give them a pleasant surprise. If you blend fear with surprise you get awe, and awe leads to amazing eLearning experiences. Use an attention grabbing graphic or pose an unexpected question that gets their mental gears turning. Catch them off guard by adding something that may seem out of place, but eventually ties into the subject matter. Riddles are also a great addition to eLearning courses if you are trying to achieve the perfect blend of apprehension and distraction, which also results in awe. There is a caveat to this particular tip, however. You need to be sure that your “wow” element doesn’t end up offending members of your audience. Likewise, it shouldn’t take them too far off course from the main ideas of the online lesson. In other words, don’t include an element of surprise just for the shock value. Use images to trigger an emotional response. We are visual creatures. While the written word may stir the soul and pull the heart strings, visuals make us feel even more emotionally connected to the eLearning experience. Use images that are familiar and relatable for your audience. There are a variety of royalty free stock photo sites online where you can download high quality images. However, you should also try to incorporate images that will instantly click with your learners, such as pictures of their sales floor or co-workers. If that’s not an option, then opt for images that visually represent the emotion you are trying to achieve. For instance, a photo of a woman with her child might make them feel joy, that is acceptance combined with serenity, while a picture of a frustrated customer will result in feelings of contempt, that may be translated to annoyance mixed with boredom. The Plutchik’s Wheel of Emotions may have been introduced to the world decades ago, but it remains an invaluable tool for eLearning professionals today. Use this guide to capture emotions, blend them to perfection, and make your eLearning course memorable for every member of your audience. Interested in learning how emotional intelligence can impact online learning? Read this article The Impact Of Emotional Intelligence In eLearning to discover how to create an emotional connection and build engagement in your eLearning courses.